There has not been a time in recent memory during which the liberal cause was in more desperate need of something new. In an election where the GOP nearly imploded before running Donald Trump as its candidate, the Democrats got swept. As the current iteration of the Democratic party is woefully short of leadership and ideas, hopeful liberals may look to the nation’s college campuses, historically the vanguard of the liberal cause, for a glimpse of what is in store for the future of the left. Any liberals hoping to find an ideology with the promise to carry America beyond its current, hopeless divisiveness will be sorely disappointed. On college campuses today, especially at the most elite schools, the liberal mainstream is obsessed with cultural critique but seldom considers the political economy that underlies our culture. If you dare to wade into a conversation about economics on a liberal campus, you will find that many students’ insights begin and end at the word “capitalism.” Of course, the campus left comes in many different varieties and degrees of radicalism, but the widespread discourse around white privilege is emblematic of a politics that prioritizes cultural values over both political pragmatism and material reality. White privilege exists, and it is ugly. Perhaps its most visceral incarnation is in police brutality. The graphic contrast between how police handled Patrick Harmon and this unidentified, white suspect in Tracey, California captures the extremes of the discrepancy in treatment. No one can reasonably imagine that a black American who behaved like the suspect in the second case, aggressively charging an officer while hurling expletive-laden threats, including what sounds like, “I’ll kill you,” would not have been killed. Police brutality is largely a result of culture; stereotypes of black men as violent, irresponsible, and drug-abusing inform the actions of officers. Cultural stereotypes attach a danger to blackness that skews an officer’s evaluation of a violent threat. The portrayal of gun violence and crime in visual media acclimates us to the image of officers shooting guilty black bodies, distorting both an officer’s judgement and the public’s reaction to these shootings. While skewed police treatment is the most brutal manifestation of white privilege, the advantages of whiteness are everywhere. Skin color shapes perceptions of financial responsibility, job performance, public speaking ability, and trustworthiness. The list goes on as different versions of white privilege arise in different contexts, but in sum, white privilege is a cultural force that confers unearned benefits and advantages to individuals based solely on skin color. Campus liberals detest white privilege, as they ought to, but their primary means to fight it do not bring it any closer to its end. In order to combat white privilege, the campus left calls it out wherever it is manifested. For example, this viral tweet that criticizes the media for labeling Stephen Paddock, the Las Vegas shooter, a lone wolf rather than a terrorist concludes with “end white privilege today.” Elsewhere, liberal students seek to hold celebrities accountable on issues of social justice. According to this strand of cultural liberalism, Taylor Swift is a symbol of the privileged complacency of white feminism. Social media activists demand that celebrities like Swift, who stayed quiet during the election, speak out on political and social issues. Undoubtedly the media’s unwillingness to label Paddock a “terrorist,” or Swift’s distance from the consequences of a rightward swing in American politics, are manifestations of white privilege. But will a media that does not hesitate to label white terrorists as such, or a Swift who uses her celebrity to promote just causes, really change the underlying institution of white privilege? The “call out, condemn, and demand” strategy of the campus left attacks the outcomes of white privilege rather than the forces that perpetuate it, addressing the symptoms and not the disease. Here is where a theme from economic thinking is useful: the overarching outcome of a system comprised of many individual actors has little to do with their individual intentions. Regardless of whether you study Friedman or Marx, whether one values free markets settling on the proper price for a good or the depletion of collective resources in the tragedy of the commons, individual actors do not choose the macro-level outcome. In a similar way, no individual or group has the agency to intentionally craft American culture at large. While the concerted efforts of cultural icons, like Swift, can tweak some segments of contemporary culture, these efforts will not change underlying values. And whatever influence a figure like Swift does have can only be effectively exercised on her own volition, not as a reaction to ridicule. In a society where minority Americans are disproportionately impoverished, uneducated, and incarcerated, our culture will justify the same dismal reality. Those seeking to dismantle white privilege should not focus on single actors, like Paddock or Swift, but instead seek to change the forces that construct the society white privilege reflects. The campus left believes that they can change American culture without changing the physical reality beneath it. To eradicate white privilege, they offer a top-down solution; white Americans need to “confront their privilege.” Although there is no official definition of what “confronting white privilege” is, it entails white Americans embarking on a painful and reflective process that ends in resolving to refrain from leveraging whiteness, in ways that they have unwittingly been doing their whole lives, to gain personal advantages. At first glance, this solution may seem to fit the principle of economic reasoning offered earlier, because it recognizes that individuals are not intentionally perpetuating white privilege. In reality, the concept of “confronting privilege” is not a solution but rather a restatement of the question. “Confronting privilege” tells white Americans, “you have been unintentionally doing a bad thing, recognize it, and stop doing it,” without explaining why they were unintentionally doing it in the first place. Additionally, the supposed conclusion of privilege confrontation—a resolution to refrain from leveraging whiteness—is an impossible ask. If the society we live in is systematically tilted in favor of white Americans, to ask them to not leverage their whiteness is to ask them to not participate in society at all. As long as white privilege exists in America, even white Americans who claim to have confronted their privilege cannot have done so. An individual cannot unilaterally repudiate the benefits constantly conferred upon them by the society that surrounds them. While the campus left’s attack on white privilege is conceptually weak, it is also politically disastrous, weakening its own ranks and its image on the national stage. Liberal organizers on campuses are constantly frustrated by the performative activism of their peers, who sign petitions, post on social media, and use the proper vernacular, but never take on the fight for structural change, in whatever forms that fight may take. But the campus left’s cultural assault on white privilege has unintentionally spawned the hollow activism that frustrates it. Since America is dominated by whiteness, the term “white privilege” quickly loses its specific meaning and becomes a placeholder for everything that is unjust in America. It is almost impossible for any movement, let alone an individual, to make visible progress in combatting white privilege when it takes on a meaning so massive. While a grassroots movement cannot swiftly address the material causes of white privilege, it can squeeze celebrities, television networks, and art museums into token concessions on the manifestations of white privilege. Performative activists are happy to participate in these movements; taking part is as easy as tweeting a hashtag. The result is that passive activists and dedicated activists appear similar on the surface, because both types participate equally in the only efforts that create visible, though unimportant, change. Cultural liberalism has no choice but to grant credit to its disappointingly passive allies because so few in the national mainstream are willing to accept the idea of white privilege in the first place. After all, “confronting white privilege” is a pretty unappealing prospect for white Americans. Even someone who earnestly cares about liberal social justice issues cannot actually fulfill the specious ritual of “confronting their privilege.” For most white Americans who conduct their daily lives away from the cerebral dialogue of leafy campus confines, white privilege politics reads as an accusation that they are villains, that everything they do to help themselves—the grades they earn for college admission, the hours they work to keep up a job and feed their family, even the TV shows or songs they enjoy—makes them increasingly complicit in the structural evil of American society. It does not matter how true the complicity of white America is if we cannot convince them of the truth. It’s no secret that white America is not particularly receptive to ideas like white privilege. White Americans voted for Trump, a candidate who regularly retweeted white supremacists, at a slightly higher rate than they voted for Mitt Romney. Voters were galvanized by Trump’s repudiation of what he labeled “political correctness,” an umbrella term which would surely include any conception of white privilege. The campus left will never convince a majority of white Americans to “confront their privilege,” and the liberal cause would be left worse off for having tried. We are back to the original problem. White privilege is an overarching outcome not intentionally determined by individuals, but continually (and misguidedly) attributed to them by the campus left. The political consequences of this misattribution are harrowing—defensive white Americans, in denial of their accused complicity, move further away from recognizing white privilege. But we are still left searching for the forces that produce the macro-cultural effect of white privilege, the forces that allow white America to leave minorities languishing beneath them. Oddly enough, the campus left pipe dream of “confronting privilege” offers us guidance. If by some miracle, every white American wakes up tomorrow morning having genuinely “confronted their privilege;” if American cultural values were transformed overnight, what would happen? An economic and political transformation. Having gained awareness of the injustice of race-based privilege, America would recognize that parental wealth, the most impactful bundle of unearned benefits and advantages, is distributed almost exclusively on racial lines and is poised to stay that way. The median wealth of white Americans is ten times greater than that of hispanic Americans and thirteen times greater than that of black Americans. The higher you go up the American economic ladder, the whiter it gets. 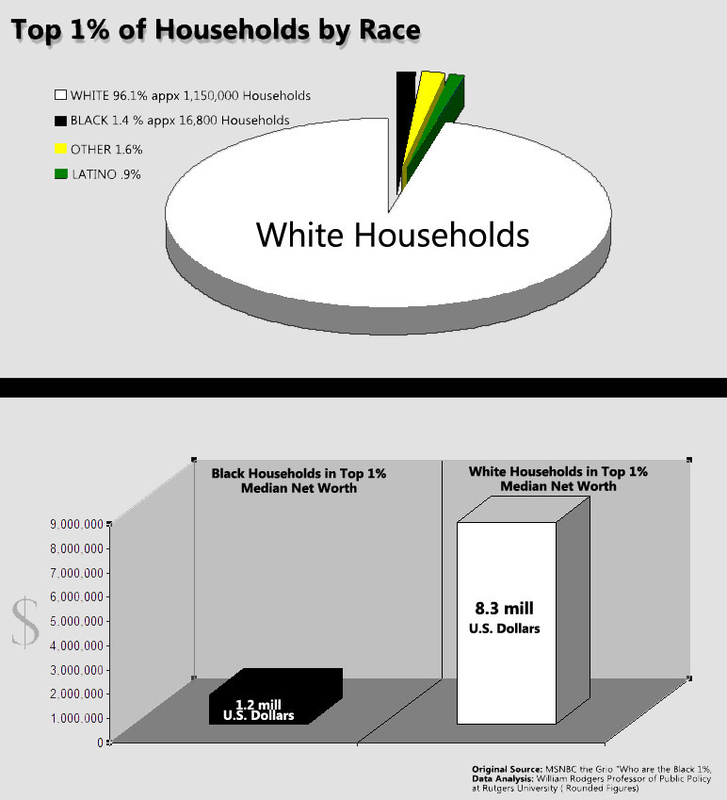 Of the wealthiest one percent of households, ninety-six percent are white. Increasingly, the wealth Americans are born into determines the course of their lives. In the last few decades, America’s economy has veered far away from our traditional notion of the American Dream—that if you work hard you will get ahead or at least earn a dignified living. In America today, hard work does not guarantee anything for the forty-three percent of Americans born poor. Economic inequality has skyrocketed and social mobility is low; America is increasingly a country where the rich stay rich and the poor stay poor. And in America, rich people are overwhelmingly white people. As long as economic inequality continues to grow and social mobility stagnates, minority Americans will be increasingly stuck to the bottom rungs of the economic ladder. In the simplest terms, Piketty argues that people make more money by owning things than by creating things. In any society where minorities own far fewer things than whites, this trend will continue to entrench the disparities between the livelihoods of whites and minorities. Americans can already see what this type of race-delineated inequality looks like. It looks like black high school seniors whose average reading proficiency is in the twenty-second percentile. It looks like massive college achievement gaps. It looks like modern-day housing segregation. It looks like HIV rates among gay and bisexual black men that amount to a full-blown epidemic. An enlightened America, dedicated to ending racial injustice, would understand how the fundamental force that drives growing global inequality is virtually blind to race, yet still works to exacerbate racial disparities in America because minorities already occupy the lowest economic tiers. An America dedicated to ending white privilege would be horrified by the implications of the growing influence of wealth in American politics. After the rulings in Citizens United v. FEC and McCutcheon v. FEC, there are practically no limits to how much individuals can donate to political causes. Spending in elections has skyrocketed, and lawmakers are increasingly beholden to mega-donors like Sheldon Adelson—who spent at least ninety-three million dollars on the 2012 elections—rather than voters. Without reform, the influence of an overwhelmingly white donor class will only increase alongside their wealth. In a society where money is speech, and minorities possess a decreasing share of the nation’s money, their already-quiet voices will be rendered even quieter. Without equal influence over lawmakers, the equality of protection before the law begins to erode, such as in Louisiana, where the Sixth Amendment no longer protects the poor; a severe shortage of funding for public defenders has left suspects who cannot afford private counsel with the choice of pleading guilty or remaining in jail indefinitely. In a felony case, after being unconstitutionally coerced into a guilty plea, innocent, poor suspects would not only lose their right to a trial, but also their right to vote. An America after the “Great Awokening,” the day when all white Americans simultaneously “confronted their privilege,” would understand that, left unchecked, the growth of wealth inequality and money in politics will dramatically perpetuate the privileges conferred upon white skin. Clear-eyed and full of contempt for racial injustice, they would seek a structural reformation of the American political economy. In pre-Great Awokening America, Americans are decidedly undivided about the decrepitude of our political economy. A survey conducted by the Democracy Fund Voter Study Group in December 2016 found that seventy-one percent of Americans agreed or strongly agreed that “our economic system is biased in favor of the wealthiest Americans” and only thirty-three percent of Americans believe that the distribution of wealth in America is fair. Voters across the spectrum are unified in their contempt for the campaign finance system. A resounding seventy-seven percent of Americans say there should be limits on the amount of money individuals and organizations can spend on political campaigns and issues. Practically everyone (eighty-five percent of the American population) believes that the campaign finance system needs to be fundamentally changed or completely rebuilt. Even without the numbers, it is clear that Americans know what is wrong. In the eyes of Trump voters, Hillary Clinton was a symbol of money politics and a failing economic establishment. They hoped that Trump’s financial independence would uniquely position him to “drain the swamp.” President Trump was elected as a gamble to fix America’s political economy. He will not. After four years of a Trump presidency, America will be no more satisfied with its political economy and perhaps filled with a little more hate for each other, be it left or right, rich or poor, white or brown. Collective support for rebuilding our political economy does not equate to agreement on specific policies. Creating a consensus on policy is the work of a politics that this country is begging for. America requires visionaries who will develop the policies that overhaul campaign finance, healthcare, education, tax code, housing, and infrastructure. America needs the brilliant minds who can craft the laws that will radically reform our political economy into one that actually reflects the American Dream, one in which every person has a genuine opportunity to succeed and where honest, hard work will earn a dignified livelihood. These brilliant minds reside on America’s college campuses. Reshaping a hulking, leaky bureaucracy into the proactive, efficient civil service that America needs will require the type of creativity and innovation that today flows from commencement straight to Silicon Valley and Wall Street. Gifted students will continue to choose bonuses over civic duty as long as our lawmakers prioritize campaign contributions over good ideas. Nothing significant can be achieved until money is expelled from our politics. Do not mistake this for the worn-out platform of the Democratic party. A survey of 1,581 people in the United States found that Americans believe that the ideal pay ratio between CEOs and unskilled workers is 7:1, but estimate it to actually be 30:1. In reality it is 354:1. While CEO pay is an imperfect metric of inequality, this is about correcting a society that is roughly fifty times more unequal than we prefer. There is no illusion here that a political economic reformation would erase white privilege overnight. Between Clinton and Trump voters, there is a massive gap in resentment toward black Americans. In a 2016 survey, fifty-five percent of Americans disagreed or strongly disagreed with the statement, “Generations of slavery and discrimination have created conditions that make it difficult for blacks to work their way out of the lower class,” and forty-eight percent of Americans believe that “today discrimination against whites has become as big a problem as discrimination against blacks and other minorities.” Too many Americans hold these despicably ignorant viewpoints, and it is not clear that demanding they “confront their privilege” will do anything to enlighten them. We can create laws that determine what people can do, but we cannot systematically determine what people will think, or the culture to which they subscribe. Democracy does not let the majority rule over culture. But since even prejudiced Americans perceive injustice in our political economy, we can rebuild our society into one where the forces that perpetuate racially delineated inequality are weakened, leaving a stronger platform for the work that is left to do. A society with a more equal political economy will develop a more equal culture. Children raised in a society where the letter of the law prohibits racial discrimination will tolerate less racism, white privilege included, than children raised in the era of slavery. We now seek to create a society in which the law prohibits discrimination in action and the economy does not wildly advantage people of a single skin color. Economic equalization will move at a glacial pace, even after a grand reformation of America’s political economy, and culture will follow. The only death that white privilege will die is a slow one. None of this is to say that liberals should refrain from discussion and contemplation of the injustice manifested in our culture. Nor should we cease to earnestly raise awareness about these injustices, especially by sharing our distinct experiences of white privilege and racial discrimination. But we should know that cultural injustices like white privilege cannot be fought in the realm of culture alone, and insofar as we can intentionally bring about cultural change, it will happen through persuasion rather than ridicule. When we forget that we must persuade America, when we tie our hopes to some vague, defiant revolutionary spirit, we fall to the extreme, to the culture wars that cast every American as ally or oppressor. In doing so, we create weak allies, socially forced into conformity, and emboldened enemies, energized by their defiance of a sanctimonious consensus. The long game the left must play will not feel good, especially for oppressed minorities who are rightfully outraged and exhausted. The politics of racial justice will be inherently unfair because the society they seek to correct is thoroughly unfair. In order to end oppression, liberals will have to swallow some principle to work with oppressors. Above all, the left must not forget to aim higher than achieving racial justice. Even if some sort of racial justice revolution were in fact possible, even if racial disparities disappeared overnight, radical wealth inequality would still leave America a society where your status at birth, not how hard you work, determines your future, and political money would keep it that way. Since last summer, liberals have rallied around a quote from Michelle Obama’s speech at the Democratic National Convention, employing it as a sort of guiding mantra to navigate an era of unprecedented political vitriol: “When they go low, we go high.” If Donald Trump and everything he represents encapsulates going low, then going high is not deriding the stupidity of working class and rural whites who voted for him on social media. Going high is not keeping up with an ever-expanding list of identity jargon and labeling those who do not follow suit as oppressors. Going high is not indulging in red-faced righteousness at the expense of our cause. Going high is declining to quarrel with those who hate, rejecting hateful politics with the cool strength that can only be derived from the truth of justice, and recognizing that the work of constructing a more just society will not be gratifying, because there will be no cathartic revolution. We must rise above the culture wars, where our inherent differences are a prerequisite for any engagement with the other side. We must offer a vision of a future for this nation that is founded upon our commonality as Americans, our persisting shared belief that the American Dream shall be revived, that America can be more prosperous for everyone. We must believe that Americans can learn to treat each other like people. The Obama era showed us how resistant the contemporary American political economy is to change, and the subsequent four years will not do us any favors in uniting the people to transform it. Fulfilling a truly progressive agenda will require the support of far more than a simple electoral majority. There is no more time to waste on an overzealous cultural politics of divergence, subscribed to by few. It is time to craft the politics of many, to end the status quo in which America lingers in toxic stagnation while inequality whizzes upward. The task is exceedingly challenging, fit for our brightest, most innovative, and most farsighted: our college students.